This engagement ring and wedding band were designed to stand alone or to be worn together, depending on the bride’s preference. 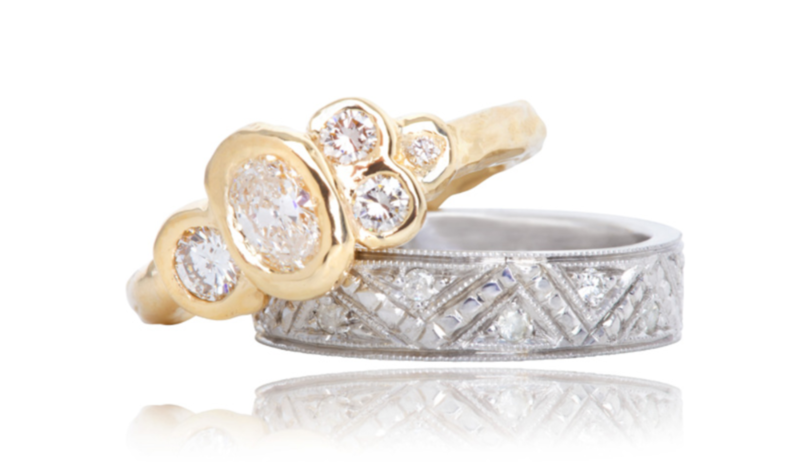 The engagement ring is the very definition of organic—yellow gold forms waxy bezels that ring round and oval diamonds. This creates a clustered look that is reminiscent of drops of rain as they land on glassy water, right before the ripples begin to spread. The wedding band itself follows this same natural vein; linear in design, this white gold and diamond-studded band is a nod to the mountain ridges that ring this couple’s favorite spot in nature.